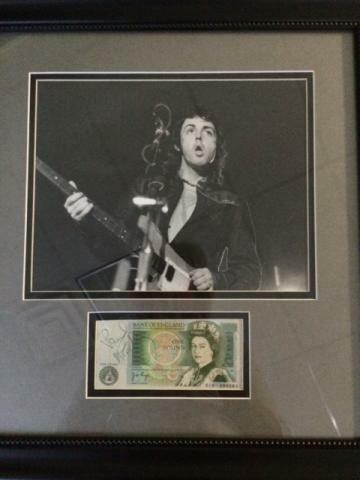 This photo presentation includes a vintage original photo as well as a Bank of England bank note featuring the autograph of music legend and humanitarian Sir Paul McCartney. 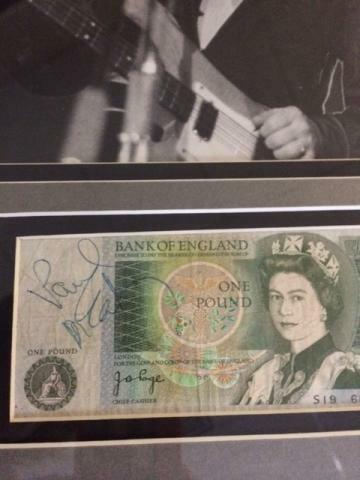 Making this signed bank note even more valuable and rare is that a few years ago McCartney stopped signing -- completely. He even turned down a $5 million offer to sign, and has refrained all subsequent offers for autographs and pictures, instead insisting that fans and the public respect his privacy. Many autographed Beatles items are secretarial, but this presentation comes with a Full Letter of Authenticity from James Spence Authentication. This very rare item featuring the autographed of perhaps one of rock music's greatest innovators and performers is something any fan and collector would love to have for their very own. McCartney's autograph is believed to be the third-most valuable among living celebrities, behind only American hero Neil Armstrong and golfer Tiger Woods. Due to the very rare of this item we will charge your credit card for the full amount immediately upon taking your order. This policy ensures we reserve the photograph for you. We will confirm your order by e-mail. Please allow at least 2 weeks for delivery. 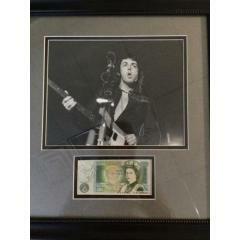 Paul McCartney Signed Photo Presentation - Authenticated $3,495.00 Sold Out!